Staying active and fit during maternity is key to your health and the health of your baby. To stay active requires assistance, and 2XU Pre-Natal 3/4 Active Maternity Tights makes it easier. Engineered with high performing fabrics and comfort, these 3/4 maternity tights protect and support areas prone to straining, while targeted compression helps improve circulation and reduces swelling to keep you feeling strong and comfortable month after month. Wide Waistband for comfort and security. Double-layered gusset for pelvic floor support. Soft-Touch tummy panel that grows with you. 1) Double-layered compression helps support your pelvic floor muscles. 2) Enhances muscle stabilization to alleviate swelling and soreness. 3) Fabric panels target the lower back to reduce pain and support your posture. 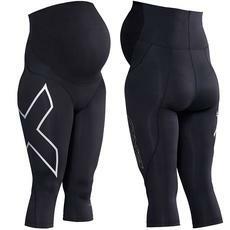 4) Compression helps reduce fatigue during activity and tired muscles after. 5) Assists in blood flow as your blood volume increases 40%-50% during maternity.